A rank above the rest, the G Pen Pro for manga use achieves a premium level of durability. 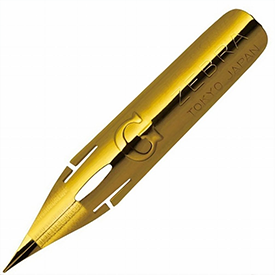 This nib is a G nib treated with titanium coating, which improves its durability and resistance to wear and abrasion, while maintaining the comfortable drawing feel. The nib can last long enough to draw a thin uniform line for about 75 meters, about 55 meters longer than conventional G nibs. This nib is an upgrade from the Zebra G (steel) nib (N118), which is made of chrome-plated steel. The titanium version is said to have four times the endurance of the steel version.